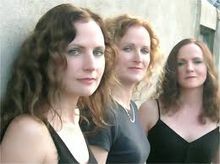 Lovely close harmony singing from 3 sisters, Claire, Sally and Susan Keane who originally hail from Bonmahon, Co. Waterford. Coming from a musical family, they were involved in the local choir, studied piano, and from an early age performed as a family group, giving recitals in the local music halls. Having lived in Dublin for over a decade, they have been involved in numerous musical escapades over the years including performing and recording with Ben Prevo. They have opened for Albert Lee on his Eire tours and supplied backing vocals to his most recent studio cd and recently performed with grammy winner Kurt Elling at Birdland in NYC. Their debut cd was released on Hideout records and the single 'Seminole Wind was on the RTE 1 radio playlist for 8 weeks on release.